Initiator of the Great Renaissance, Esteemed President-Reformist! 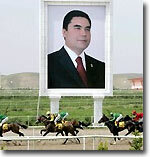 "Blessed by Allah, elected and trusted by the people, esteemed President of Turkmenistan Gurbankuly Berdymuhammedov!" is how letters to the head of state published in the Turkmen media invariably begin (with minor variations). The first anniversary of Berdymuhammedov's inauguration marks completion of establishment of the personality cult. 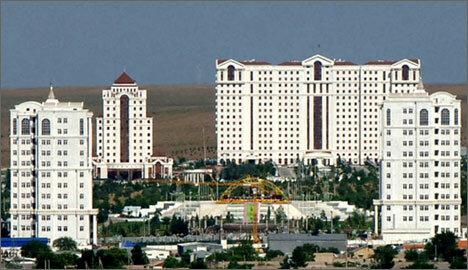 The Republic of Turkmenistan has a new "-bashi". Saying that something was wrong under the late president is practically permitted now. Sure, no street demagogues are to be allowed to pin the blame on the Turkmenbashi himself but hints that something was afoul under Saparmurat Niyazov are numerous. Consider how Berdymuhammedov's reign is appraised in the media - as Renaissance. Does it mean that Niyazov's days were a period of stagnation? 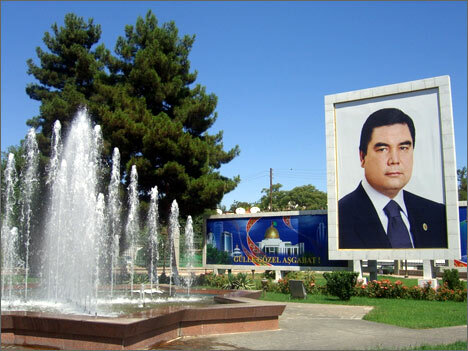 Whatever changes in Turkmenistan under Berdymuhammedov may have taken place, flowery praise in newspapers and on TV networks remains unchanged. This is how Neitralny Turkmenistan (the central official newspaper) describes the forum arranged to celebrate the first anniversary of Berdymuhammedov's election. Piece titled "President Elected and Empowered by People" states that "... this truly momentous event, crucial for the people and the state, took place but a year ago... It is clear already that the date of the election marked the beginning of a new period in history of the Turkmen state, an era of Great Renaissance and grandiose reforms..."
The newspaper does not exactly dwell on what the "grandiose reforms" come down to but the Turkmens require no explanations. "The country has a new president now. Nobody intends to condemn the previous leader, but he is history now. Time has come to shift the emphasis," is what the Turkmens read between the lines. "Day by day and hour by hour, never for a moment forgetting promises made to the people, President Gurbankuly Berdymuhammedov goes about achieving his goals. His inexhaustible energy, colossal industriousness, and enthusiasm inspire the Turkmens to new accomplishments," is the leitmotif of TV and newspaper reports. As a matter of fact, the new leader's personality cult is based on the ruins of his predecessor's. The same media outlets reported similar triumphs and accomplishments and ascribed them to a different dictator two and three and five years ago. Under Niyazov, it was good manners to berate Communists and Russian colonizers who had driven the Turkmen people to impoverishment. Nobody is spitting at the portraits of the late Turkmenbashi yet (and unlikely to begin, ever). Hosannah to Berdymuhammedov is based on mild and veiled criticism of Niyazov's reign. Here is another excerpt from Neitralny Turkmenistan (February 7, 2008), actually from a letter to it by a teacher of the Russian language and literature from the district of Gerogly. "... Russian language and literature teachers regularly organize Russian Language Weeks for our students. In the past, however, there was something lacking and everyone from teachers to students themselves felt it. It is different now. 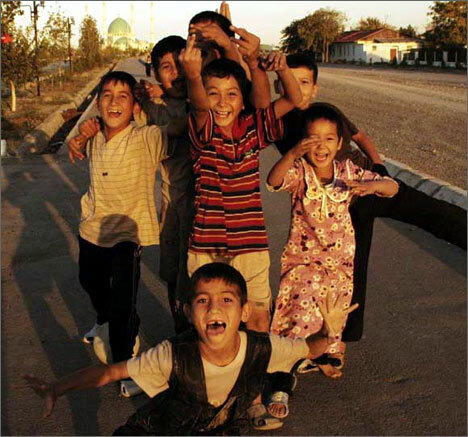 The ten-year secondary education reinstituted, all roads are open before youths again. Reforms in the sphere of education revived interest in knowledge in our students..."
By and large, nobody in the post-Soviet zone so much as begins to come close to the Turkmens' mastery of the art of flattery. Court sycophants present Turkmenistan of "the Great Renaissance" period as Paradise, its wise ruler a deity. "Initiator of the Great Renaissance, Esteemed President-Reformist!" is how a dentist (Berdymuhammedov) is addressed. "We all are witnesses to how - thanks to your leadership - the Turkmen people reached new frontiers to the amazement and vast respect of the international community. The strategic and tactical reforms you initiated (specific, considerate, aimed at progress and modernization of all spheres of life) imbue every Turkmen with feelings of pride in the Fatherland and in being a citizen of so advanced and progressive a state," this is how reforms are described in the media. And here is what is said about the future. "Rest assured that, inspired by the greatness and grandiose scale of the constructive steps you initiate and the decisions you make, we will ever remain active propagandists of your progressive ideas, innovations, and fundamental reforms. We will diligently work to live up to your expectations..."